Kitchens continue to trend towards dark finishes, textures and thin surfaces. If you’ve just ordered your new and shiny white kitchen, then the trendsetters in Italy will tell you that you’ve got it all wrong. White is out and dark is in, and we mean really dark. 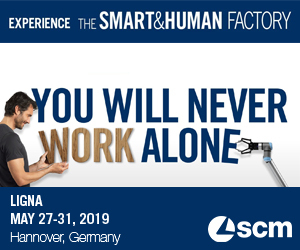 That was the message at EuroCucina, April 17-22, the world’s largest and most important international kitchen event that is part of Salone del Mobile, which attracted more than 370,000 visitors to the Milan Fairgrounds in Rho. 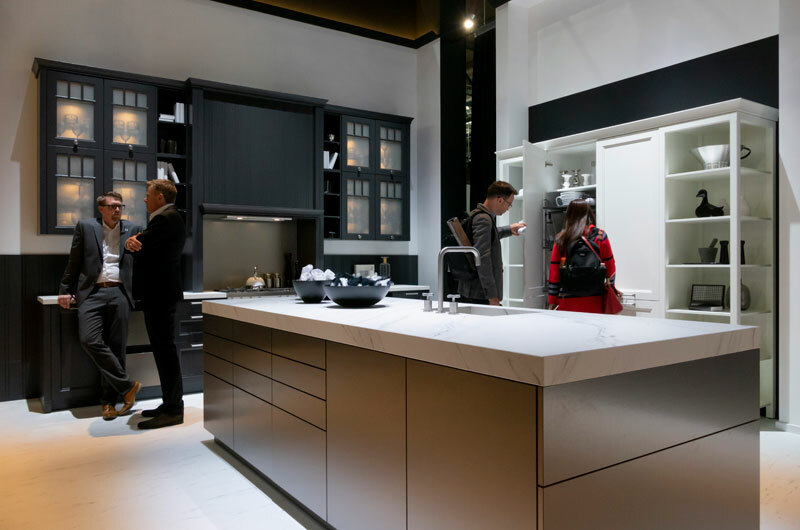 This year’s show featured integrated living and kitchen spaces, modular designs with clean lines and surface, mixed materials and dark, natural colours and matte finishes. The popularity of oversized doors and pocket doors first seen two years ago continued and there were more mixed materials, mostly thin countertops, and a lot of metal. Glass is also still popular, but perhaps surprisingly, there was a lot of open storage and open shelving without sides, according to George Pavlov, national architectural & design specification manager with GRASS Canada. But of course there is no right or wrong and trends being just that, who’s to know if we’ll ever see all the extremes of EuroCucina take hold in North America. What is clear, however, is that the trend towards darker and more textured finishes is starting to show up in Canadian kitchens and it will only get stronger. 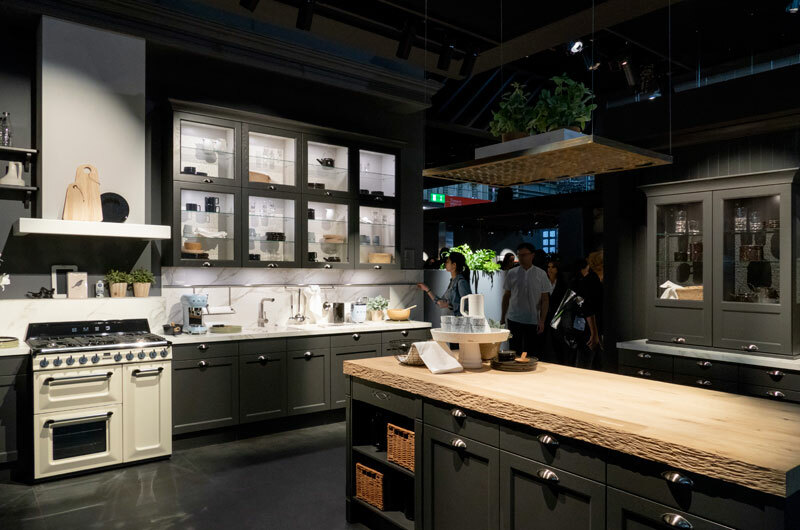 We are already seeing some of those darker finishes and even dark interiors here, the popularity of textured finishes is also on the rise, but EuroCucina was quite extreme. Shawn Pressley, marketing manager for Salice America, sums it up best when he said that although the halls were very well lit and exhibitors used great lighting in their display areas, the feeling when you walked into the halls was one of darkness, almost gloomy because dark matte surfaces dominated. But it was also stunningly beautiful and incredibly innovative. 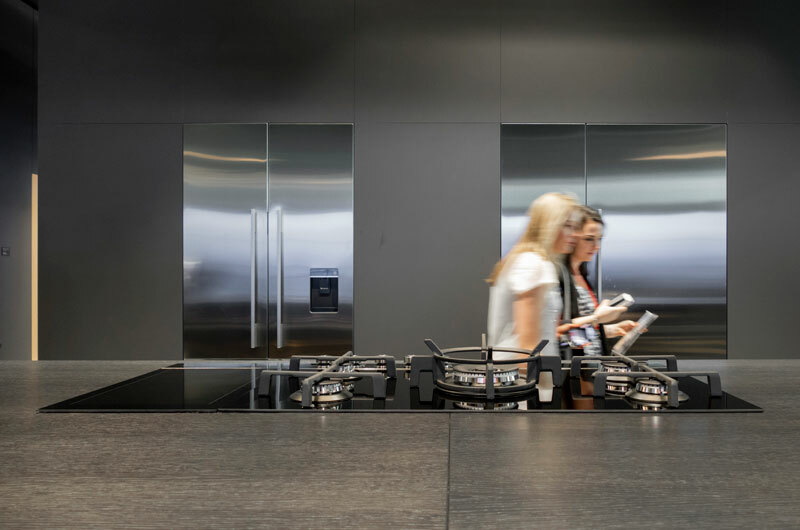 The trend started at EuroCucina 2016 and this year it seems the industry leaders doubled down on that theme of dark, matte and textured surfaces. “And slab doors and handleless everything dominated,” said Kevin Tratt, president and general manager of Blum Canada. 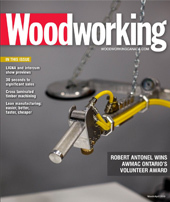 “There was very little external hardware, and no decorative hardware, instead we saw channels, finger pulls and beveled pulls or push to open. Tratt said he saw a lot of wood grains, textured melamine and ‘pebbly’ finishes and nothing buffed or polished. Metal was used more than in previous years, but it too came in dark finishes. “There are still white kitchens of course, but they are far and few between, they are quite rare now,” Tratt said. Countertops and surfaces in general are thin now with metal, often gold and copper-coloured accents, said Pavlov. But even the accents were in a matte or champagne finish and not glossy or shiny. “Throughout the show I saw a reoccurring pallet of earth tones of taupes and stone-greys, and dark colours combined with matte black. “Not only were these used in the cabinets, but on countertops, sinks appliances and other elements such as the faucets and decorative components,” Pavlov said. Back splashes were where you saw the increase of functionality with integrated storage option and bold prints. He also said he noticed a lot of natural wood texture and raw edge treatments, again these were used in natural, warmer earth tone colours. “Shelving and upper cabinets are trending towards a more open and easily accessible storage,” he said. Pavlov also said the live-edge look is still very popular. Whether natural or manmade products, the look of a live edge in lighter woods looked very elegant. “Painted slab doors are still popular, but textures and a wood-look with grains looks to be taking over,” he said. “They’ve gone away from the overworked, smooth look to something more natural and textured. Another trend really taking hold is dark interiors. We are seeing a lot of dark interiors, said Tratt, it’s very popular and we’re even starting to see some patterns in interiors now. “Also a lot of touch to open and lift systems, and sliding doors are also still popular, but perhaps a little bit less so than I had expected,” Tratt said. “And many textures have an almost raw look to them now, I saw very little that was polished and shiny. Solid wood accents were still there, but there were more manufactured than natural materials. But they certainly looked natural; it’s very difficult to tell now, they have gotten so good. And it seems every kitchen had some aluminum, said Pressley. “We saw a lot of aluminum doors, usually in a dark, matte finish and often with clear or textured glass.